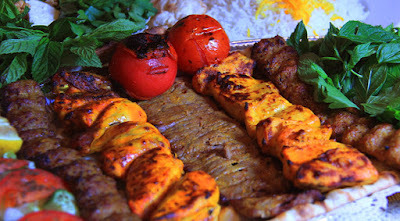 Uppersia Iran Travel blog: Iranian Kebabs. Iranian people enjoy eating and cooking but they love parties and gatherings more! In their parties, they usually serve traditional cuisines of Iran like different kinds of stews and Iranian kebabs. Kebab is an old Iranian cuisine and is a good choice for gatherings and camping days of the weekends because preparing the Kebab is done by two or three people and it gathers the friends. As a custom in Iran, preparing the kebab is the men’s job so it is usually done by the men. The meat for Iranian kebab should be fresh and healthy and it is usually marinated in spices, onion, yogurt or different sauces some hours earlier. Grilling the kebab is the fun part. Friends gather around the broiler, while the meat is getting done and it spreads an appetizing smell in the whole area. Persian kebab is served with saffron steamed rice or Lavash bread. Sumac, Salad Shirazi (chopped tomato and cucumber with mint and verjuice), raw onion and basil are the inseparable mates of Iranian Kebab. Kebab Koobideh: Koobideh can be named as the most popular one and it includes ground beef, onion, salt and paprika. This paste is grilled on a skewer and believe it or not sometimes kebab koobideh is served with raw yolk! Kebab Barg: Kebab Barg is the lovely one! It is grilled marinated sirloin and a good Kebab Barg is so soft and juicy. Juje Kebab: Juje Kebab is grilled chicken on skewers. It is marinated in different sauces made with yogurt, saffron, or even ketchup. Kebab Sultani: Sultani is the king on the Kebabs menu! It is the combination of Barg and Koobideh served with steamed rice or Lavash bread. Kebab Bakhtiari: Bakhtiari is the combination of Juje and Barg. This one has been invented by Bakhtiari nomads of Iran. Dandeh Kebab: This Kebab is grilled lamb chop marinated in tomato sauce and chopped onions. Dandeh Kebab is the traditional Kebab of Kermanshah, in the west of Iran. Kebab Torsh: Kebab Torsh is cooked by the people of Gilan, in the north of Iran. It is grilled beef marinated in a sour sauce, including pomegranate juice, walnut and parsley. Kebab Tabeh: Kebab Tabeh is usually made at home as a fast and delicious meal. The ingredients are the same as kebab Koobideh but it is roasted in a pan. Most of the cities in Iran have unique traditional cuisines and you will be offered different flavors as you travel around Iran. You can also join Uppersia’sculinary tour and meet the hospitable Iranian people at their houses, while you learn how to cook the tasty cuisines of Iran.